14 publications with the keyword "cloud"
Tracking both structure and motion of nonrigid objects from monocular images is an important problem in vision. 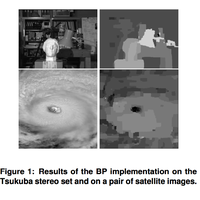 In this paper, a hierarchical method which integrates local analysis (that recovers small details) and global analysis (that appropriately limits possible nonrigid behaviors) is developed to recover dense depth values and nonrigid motion from a sequence of 2D satellite cloud images without any prior knowledge of point correspondences. This problem is challenging not only due to the absence of correspondence information but also due to the lack of depth cues in the 2D cloud images (scaled orthographic projection). In our method, the cloud images are segmented into several small regions and local analysis is performed for each region. A recursive algorithm is proposed to integrate local analysis with appropriate global fluid model constraints, based on which a structure and motion analysis system, SMAS, is developed. We believe that this is the first reported system in estimating dense structure and nonrigid motion under scaled orthographic views using fluid model constraints. 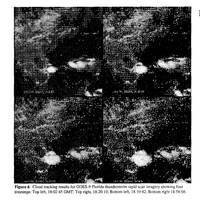 Experiments on cloud image sequences captured by meteorological satellites (GOES-8 and GOES-9) have been performed using our system, along with their validation and analyses. Both structure and 3D motion correspondences are estimated to subpixel accuracy. Our results are very encouraging and have many potential applications in earth and space sciences, especially in cloud models for weather prediction. L. Zhou, C. Kambhamettu, D. Goldgof, K. Palaniappan, and A. F. Hasler. 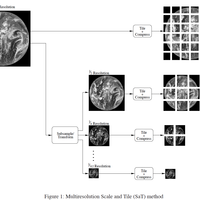 Tracking non-rigid motion and structure from 2D satellite cloud images without correspondences. IEEE Trans. 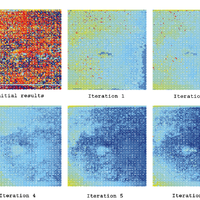 Pattern Analysis and Machine Intelligence, volume 23, issue 11, pages 1330--1336, 2001.
keywords = "visualization, big data, parallelization, cloud, remote sensing"
Automatic cloud tracking is an extremely important and challenging problem. Tracking clouds provides an estimate of the cloud-drift wind velocities, which is useful for a number of meteorological and climate applications. In this work, we propose a novel method for automatic tracking of clouds, including the tracking of eye of the storm in case of hurricanes. To the best of our knowledge, this is the first integrated system for automatic cloud tracking using super-rapid scan data which produces a dense wind-field estimate using a hierarchy of motion models that includes global storm motion tracking. 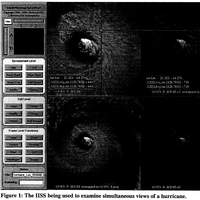 We have experimented with 490 frames of a remarkable 1-minute image timeseries of hurricane Luis, with a dynamic resolution of 10 bits per pixel captured by the GOES-9 satellite. 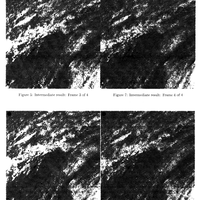 Our approach uses hierarchical motion decomposition technique, wherein the first level models the global rigid motion and tracks the eye of the hurricane (thus the storm motion), the second level models the local non-rigid deformable motion and tracks the storm-relative clouds at a coarse scale using region-based image subtraction, and the third level models the local non-rigid semi-fluid motion and tracks storm-relative deforming clouds at a finer scale using region based cross-correlation. 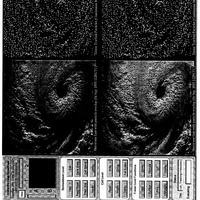 Output from the system includes accurate velocities with the latitude, longitude and time information for each pixel in the hurricane sequence. We demonstrate a high accuracy of the algorithm through our experiments using comparisons with manual tracking analysis. Visualization of the results is performed using the Interactive Image Spread Sheet, designed for such hyper-image environments. Future work includes the use of multispectral information, cloud motion segmentation and developing physical models for operational cloud-tracking performance. C. Kambhamettu, K. Palaniappan, and A. Hasler. 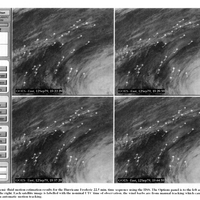 Hierarchical motion decomposition for cloud-tracking. 17th Int. AMS Conf. 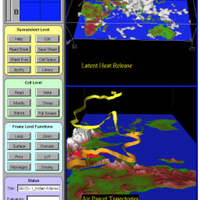 on Interactive Information and Processing Systems (IIPS) for Meteorology, Oceanography and Hydrology, pages 318--323, 2001. The new generation of Geostationary Operational Environmental Satellites (GOES) have an imager instrument with five multispectral bands of high spatial resolution,and very high dynamic range radiance measurements with 10-bit precision. A wide variety of environmental processes can be observed at unprecedented time scales using the new imager instrument. Quality assurance and feedback to the GOES project office is performed using rapid animation at high magnification, examining differences between successive frames, and applying radiometric and geometric correction algorithms. Missing or corrupted scanline data occur unpredictably due to noise in the ground based receiving system. Smooth high resolution noise-free animations can be recovered using automatic techniques even from scanline scratches affecting more than 25 percent of the dataset. Radiometric correction using the local solar zenith angle was applied to the visible channel to compensate for time- of-day illumination variations to produce gain-compensated movies that appear well-lit from dawn to dusk and extend the interval of useful image observations by more than two hours. A time series of brightness histograms displays some subtle quality control problems in the GOES channels related to rebinning of the radiance measurements. The human visual system is sensitive to only about half of the measured 10- bit dynamic range in intensity variations, at a given point in a monochrome image. In order to effectively use the additional bits of precision and handle the high data rate, new enhancement techniques and visualization tools were developed. 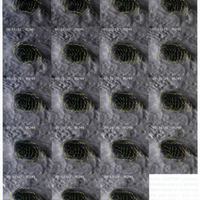 We have implemented interactive image enhancement techniques to selectively emphasize different subranges of the 10-bits of intensity levels. 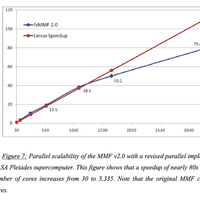 Improving navigational accuracy using registration techniques and geometric correction of scanline interleaving errors is a more difficult problem that is currently being investigated. M. Jentoft-Nilsen, K. Palaniappan, A. F. Hasler, and D. Chesters. 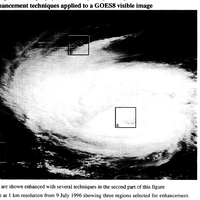 Enhancement and quality control of GOES images. SPIE Proc. on GOES-8 and Beyond, volume 2812, pages 133--145, 1996.